Sue Hatfield, William Tong, and Peter Goselin at their final debate on Tuesday. During the final debate this week between candidates for state attorney general, the contenders were asked a question that defines the race: How would they decide whether to join other attorneys general in filing multi-state lawsuits against businesses and the federal government? The answers given by Republican Susan Hatfield and Democrat William Tong marked a pronounced — and sometimes bitter — divide in each candidate’s proposed approach to the job. Hatfield, a state prosecutor from Pomfret who served as a delegate for President Donald Trump at the 2016 Republican National Convention, said she would decide on a case-by-case basis while weighing what would be in the best interests of Connecticut’s residents. 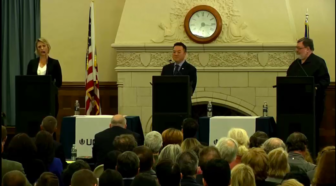 Tong said he would defend the state against the Trump administration’s attacks on the Affordable Care Act, clean air and water, immigrants and, most recently, birthright citizenship granted under the Fourteenth Amendment. “And if standing up to the president of the United States is being political, then it is what is, because I’ll stand up to Donald Trump every time,” Tong declared. Despite that fundamental difference, both Hatfield and Tong would help Connecticut reach a milestone—as voters prepare to elect either the state’s first female attorney general or the first Asian American to hold constitutional office. Peter Goselin, an attorney and Green Party candidate, is also running for the seat. In the weeks running up to the midterm elections, Democrats across the country have used Trump as a means to ignite their base to vote in the midterm elections. The race between Tong and Hatfield has become a prime example of that, as the candidates have battled about whether Trump is relevant to the work of the state’s top law enforcement officer and the legitimacy of being an activist attorney general. 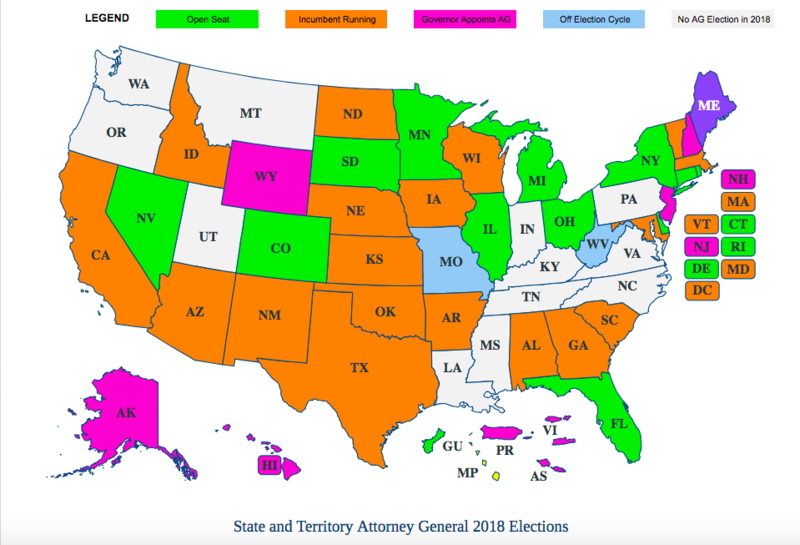 Connecticut is one of 12 states where the incumbent isn’t running for reelection on Nov. 6, according to the National Association of Attorneys General. Republicans currently control 27 attorney general offices, while Democrats control 22 (one is an independent). Connecticut’s attorney general, unlike those of other states, deals only with civil litigation issues and has virtually no criminal jurisdiction. Attorney General George Jepsen said he can only remember one criminal case that came to his attention during his eight-year tenure. Jepsen, a Democrat who is not seeking re-election, has sued the Trump administration 29 times, filed 38 amicus briefs, and signed two dozen letters opposing administration policies weakening air-pollution standards and consumer protections, banning travel from Muslim countries, and defunding Planned Parenthood. Jepsen, who recently endorsed Tong, said Connecticut is currently leading or co-leading some of the largest bipartisan multi-state investigations, including on opioid manufacturers and distributors, pervasive and systematic price fixing in the generic drug market, Equifax and other data privacy issues. Tong, a state representative from Stamford, is unapologetic about his criticism of Trump and his plans to challenge him with lawsuits. The 45-year-old Democrat said his background as a son of Chinese immigrants has made it easy for him to promise to be an aggressive counterweight to the Trump administration. Tong said some of his first priorities would be to join Democratic attorneys general in fighting a Texas lawsuit led by their Republican counterparts seeking to strike down the Affordable Care Act, addressing Connecticut’s crumbling foundations issue by taking on the insurance companies, and creating a civil rights division within the attorney general’s office. Tong, who sponsored a recent bill signed by Gov. Dannel P. Malloy that bans bump stocks, said the new state attorney general will have to deal with the risk that Congress forces Connecticut to accept gun permits from other states, as well as defend the state in ongoing efforts to keep out untraceable 3D-printed guns. He said the attorney general would be in the position to protect and defend Connecticut’s prerogative as a state to have some of the strongest gun laws in the nation. Despite his opponent’s persistent needling, Tong does not have qualms about Hatfield’s criticism that he would be an activist attorney general. “And my response to Sue is you’re damn right I will be,” Tong said. “I’ve always been activist in the legislature and I’m going to be activist as an attorney general because that’s what you need right now. 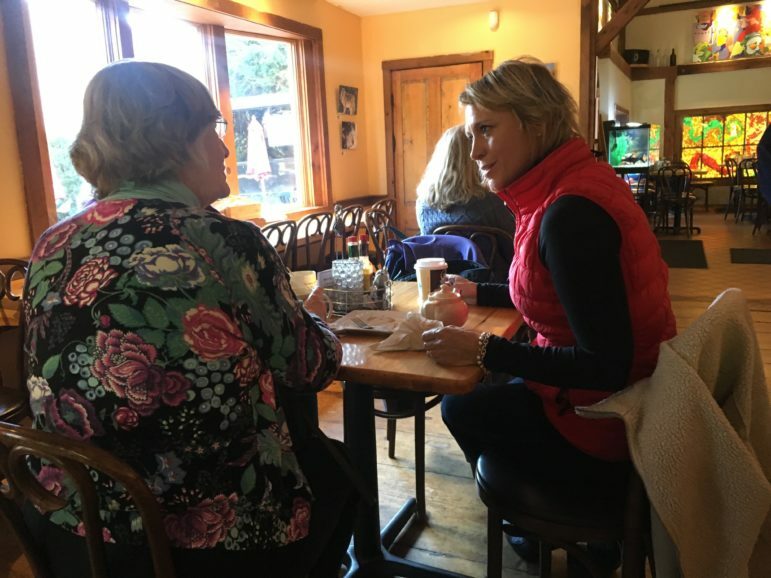 Republican Sue Hatfield speaks to a local resident at a cafe in Pomfret last week. Hatfield, who once worked in Washington as a young policy aide to former U.S. House Speaker Newt Gingrich, boarded a black bus outfitted with her campaign decals last week to meet voters in the four corners of the state. The endorsed Republican candidate is on leave from her job as a state prosecutor during the campaign season. Hatfield touts her job as making her more qualified for the position, namely because — unlike her opponent — she has tried cases to verdict. Hatfield said she also stands apart from Tong because he would cut off communication with the Trump administration and has stated he would act as a firewall against its policies. “I am very different and I believe in a bipartisan approach,” Hatfield said, adding that although there will be “issues that come out of Washington that I will push back upon,” there will also be times when she will work with the Trump administration on issues that will benefit Connecticut. Hatfield insisted she would look at what issues impact Connecticut, not whether there is a Republican or Democrat in the administration. Hatfield said one of her top priorities would be to make Connecticut more business friendly. She said that will involve assigning a team of lawyers to go through the state’s regulations and tax codes to assess what is impeding business growth. Hatfield said her other priorities will involve initiating an investigation into crumbling foundations to determine “who knew what when,” tackling the opioid crisis, and human trafficking. Hatfield received the endorsement of the state’s largest gun owners’ group, the Connecticut Citizens Defense League, only to lose it after she expressed her opposition to 3D-printed firearms. She has said she remains a strong supporter of the 2nd Amendment. Hatfield has worked as a registered nurse and, like Tong, believes people with preexisting conditions should be covered by health insurance. But the Republican did not specify if she would join the Texas lawsuit and said she has not read the case yet. “I would need to look at the pleadings, look at what stage it is, so that is something I would consider,” Hatfield said. The candidates have also repeatedly clashed over their commercial advertisement, in which Trump and crime have remained central themes. 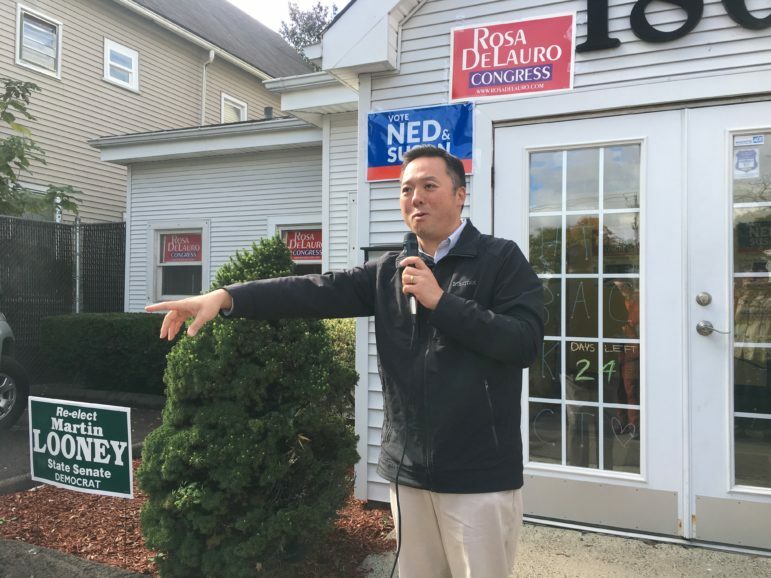 Tong has focused his ads on highlighting his plan to oppose Trump’s policies and depicting Hatfield’s support for the president. The Democrat has used a video interview Hatfield gave to the New Haven Independent as a focal point to criticize the Republican for her views on immigration and the Trump administration’s policy of separating children from their parents in immigration detention cases. In that interview, Hatfield said, “I do, I do” when asked whether she supports that policy. In another part of the interview, Hatfield said she does not support sanctuary cities and believes there needs to be a clear path without onerous obstacles for people trying to become legal citizens. Hatfield later walked back her comments on the Trump administration’s “zero tolerance” immigration policy and said she does not support it. For Hatfield’s part, her commercials have emphasized crime, and her experience as a prosecutor. Her opponent has called the ads misleading and said Hatfield is trying to deceive Connecticut voters. An ad released before the GOP primary focused on turning the office into a crime-fighting tool despite the attorney general’s lack of power in those areas. “As our next attorney general, Sue Hatfield will punish those who prey on our children, cracking down on sexual predators and human trafficking. Hatfield will bring down drug lords and violent criminals who profit from opioids, meth, and heroin addiction,” the ad said. A headline in the commercial suggests that a suspect in a Griswold triple murder gained early release under good-time credit legislation backed by Tong. But the suspect was paroled by the autonomous Board of Pardons and Parole, not released due to time shaved off his sentence under the state’s Risk Reduction Credit program. Hatfield said she stands by the commercial, describing it as “a contrast ad” that speaks to her qualifications as a prosecutor who is keeping Connecticut safe versus Tong’s work releasing criminals. Despite the candidate’s disagreements, the importance of helping Connecticut reach a new political benchmark is not lost on either of them. Tong said his parents are feeling nervous about the history-making aspect of his candidacy. “We didn’t know until August 14th whether Democrats in this state wanted the first Asian-American constitutional officer. We won’t know until November 7th whether the state wants the first Asian-American constitutional officer,” Tong said.